Once again, I am back with another installment in my look at the television episodes directed by Samuel Fuller… but this is the final post! Not just of these TV posts, but for the entire Sam Fuller series! Instead of going out with a bang reminiscent of Fuller’s dynamic opening shots, we’re gonna go out with a whisper from a TV playing in the next room. I casually started reviewing Fuller films in 2010, so to finally finish everything off is a huge source of joy for me. I love Fuller, but I’ll be glad to be moving on to other things. 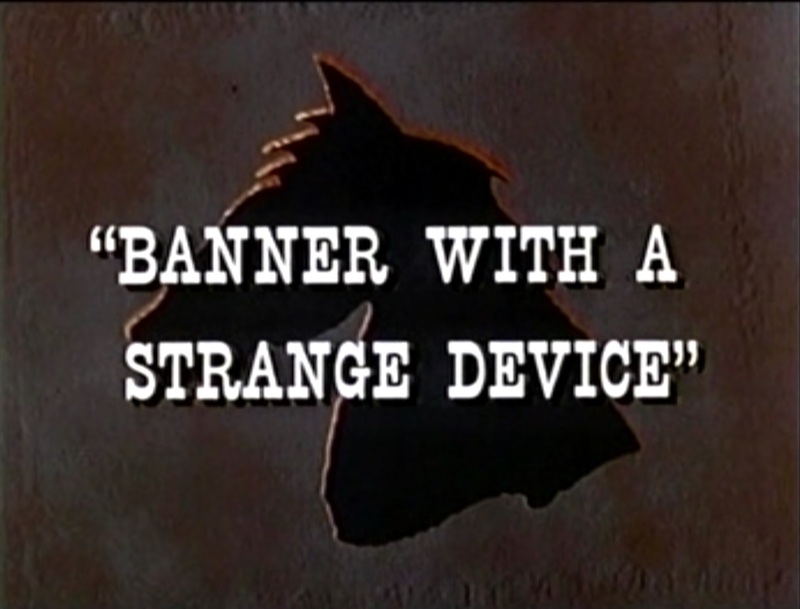 Banner with a Strange Device is an episode that ditches the general Iron Horse format and focuses on the orphan Barnabas (Robert Random). The BPS&D train arrives in the town of Banner, where Calhoun has come to collect on a $50,000 wager he made with the namesake of the town, Big Jim Banner (Jeff York), that the railroad could reach his town before the first snow. 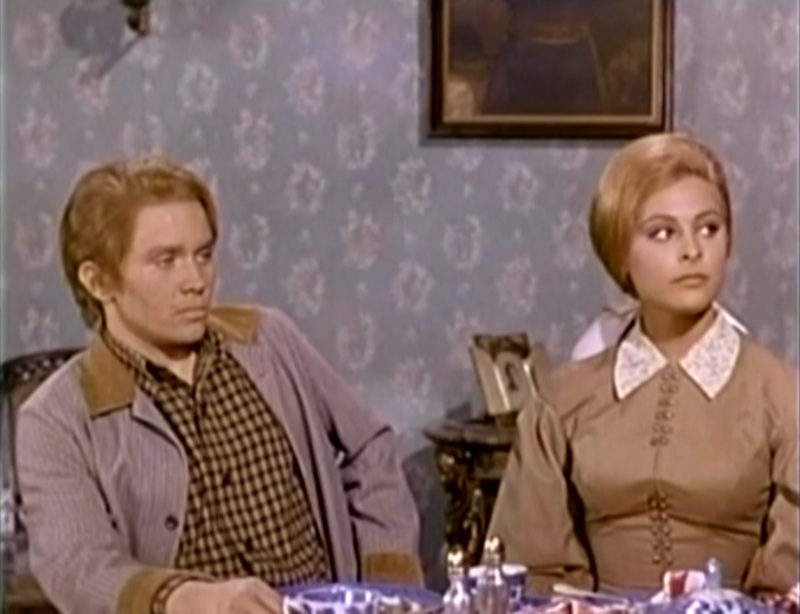 They make it, but as soon as Barnabas steps off the train — to chase his pet raccoon that, as far as I can remember, hasn’t appeared in any of these Fuller-directed episodes — he is assaulted by a couple of dudes that think he’s a member of the Clayborne family. Around this time in the episode, there seemed to be a few minutes of missing footage in my copy, so I’ll blame not completely understanding what was happening on this. Why does Big Jim Banner’s son, Young Jim (Dean Pollack), hate the Clayborne family so much? I can’t be sure. I took it as something of an age-old Hatfield and McCoy rivalry, but there were a few things that made me think it was somehow related to the hand of the beautiful Kitty Clayborne (Brenda Benet), but don’t quote me on that. Anyway, it doesn’t really matter. What matters is that they’re fightin’! Then Barnabas, orphan that he is, starts to wish for a place to call home so he ventures out to the Clayborne homestead to talk with them. One thing leads to another and somehow now the $50,000 bet between Banner and Calhoun is negated by Barnabas’s questionable parentage? Wasn’t it based solely on the railroad reaching the town? I don’t know why I’m wasting this much time wondering about all this, because I’m literally going to forget it all a few minutes after I post this. I guess I’m stuck trying to piece it all together because there wasn’t much else to do with the episode. It’s a poor piece of television to say the least. Even when Fuller unleashes his trademark wide shot of stuntmen fighting, it’s awful. It just looks like a couple of dudes flailing in the dirt. This scene is also intercut with medium shots of Barnabas and his attacker Jeff Clayborne, which is an odd choice in this specific fight as both men are played by Robert Random. In any case, the illusion of the same guy fighting himself is sold well-enough and is believable. The other sidekick, Dave, was absent in this episode, but there was a new guy, Nils Torvald (Roger Torrey), filling in a fair-sized supporting role. He might’ve been in the other episodes, but if he was, he part wasn’t big enough for me to notice him. Anyway, his character is European — I’m guessing somewhere like Sweden or Finland — and he speaks with a thick accent and broken English. I don’t know how he ended up on the railroad, but he definitely seems like an interesting choice for a character. If nothing else, it’s nice to see someone in a show like this who’s not the standard American, although the whole “broken English, sorta-feeble minded thing” is kinda ridiculous. I also found the title intriguing as it seemed to have little to do with the episode. It is apparently a reference to a poem by Henry Wadsworth Longfellow titled Excelsior. The poem is about a man carrying a banner through a mountain town, ignoring the warnings not to proceed up the mountain. He is later found in the snow by a dog, his hands still holding onto the banner. The only correlation I can see is that Barnabas is like the bannerman, proceeding onward towards his supposed family despite all warnings and misgivings of those around him. It makes you think a bit, but it’s still not a very good episode. I’d say skip this one, without a doubt. The Red Tornado also forgoes the usual Iron Horse setup, and focuses on a young Native American kid named Red Feather. He is the lone survivor of the Arapaho tribe in this area, and the Shoshone tribe apparently won’t rest until the last of the Arapaho is dead. Apparently the two tribes were historically enemies, so there is at least some basis in fact for this story. Anyway, the BPS&D happens upon the remains of the Arapaho tribe (convenient of the Shoshone to slaughter them alongside the railroad tracks! ), and while investigating Calhoun discovers that Red Feather is still alive. And by “discovers,” I mean that Red Feather sneaks up on Calhoun with a knife in hand and they have a skirmish which results in Calhoun spanking Red Feather into submission. 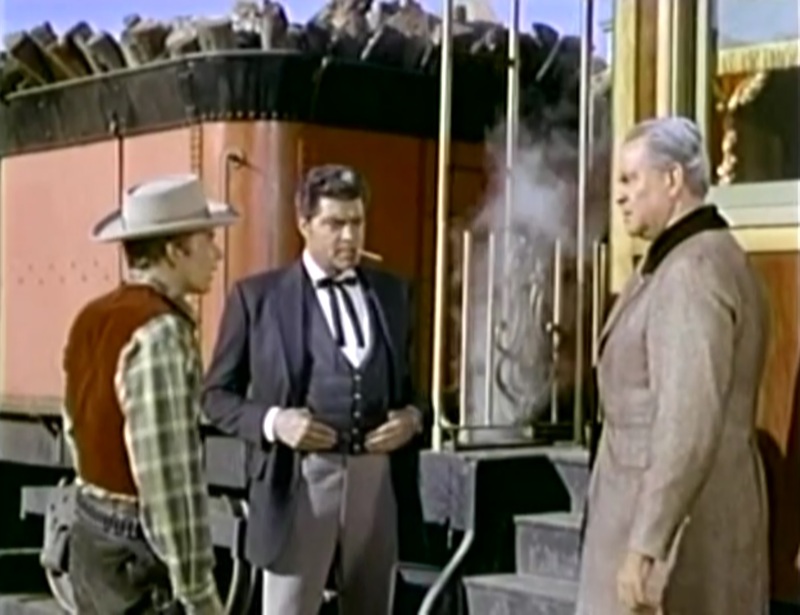 Calhoun takes Red Feather aboard the train, feeding him and tasking Barnabas with bathing him. Red Feather doesn’t fit in much with the white man’s way of doing things, though, eating the soap and threatening Barnabas with a fork. Trouble really kicks into high gear when Calhoun takes Red Feather into town to give him some new clothes. There they run into Cabot (Jock Gaynor), a man who hates all Native Americans because the land he once claimed has since been reclaimed by the government and given to the Native Americans as a reservation. This struggle of words quickly turns to a struggle of fists. I think there has been a fist fight in every episode of Iron Horse I’ve reviewed, but this one is something special. I imagine Sam Fuller told the stuntmen to go wild, as it seems like their specific purpose is to destroy as much of the store as possible. In between blows you can almost see them looking for something untouched to throw the guy in front of them into. This makes the fight rather funny and quite entertaining, though I’m almost positive this was all unintentional. The most interesting aspect of The Red Tornado for me was that the writers acknowledged the Native Americans’ right to the land. Perhaps I’m just naive and by the mid-to-late ’60s there were many films or TV shows expressing this fact. Not that The Red Tornado is some great example of social commentary or anything, but it does feel fresh for the time. The way it’s written makes the American out to be the disgruntled villain, and I just can’t imagine too many TV shows or films bold enough to do that. Perhaps this was Fuller’s influence, but since he isn’t credited with writing this one I think the credit is probably due elsewhere. 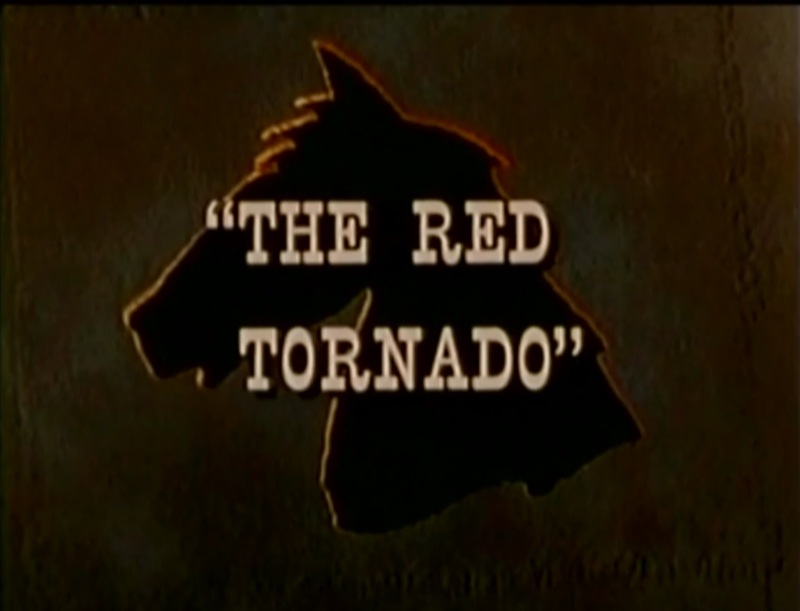 The Red Tornado is probably the most dramatically engaging episode of Iron Horse that I’ve seen, but it was still too slow moving for my taste. I’d recommend it over most of the other episodes though.